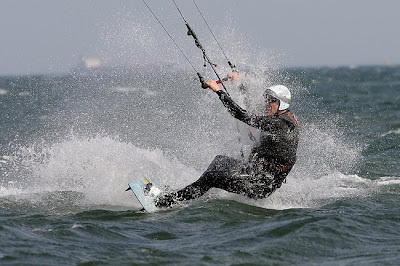 Riding upwind is the key to kitesurfing. While it is theoretically possible to ride at up to a 40 degree angle to the wind, in practice with normal equipment 10 to 20 degrees upwind is achievable. Once you can stay upwind you don't have to walk back along the beach at the end of each run (the "walk of shame") so you can keep kitesurfing in one location as long as you like. Experienced kitesurfers can ride upwind at angles greater than 10-20 degrees using specialist equipment such as race boards and foil boards. 2. Edge. On a twin-tip board you must be riding on an edge - angle and steer the board in the direction you want to go, rather than letting the kite drag you directly downwind. The board will be at a 45 degree angle or greater to the water. 3. Kite position. If you are struggling, consider bringing your kite lower. The higher the kite is in the sky, the more it will be pulling you vertically up, rather than horizontally upwind. Try your kite at 45 degrees or lower and you will have better ability to go upwind. This is of course dependent on wind strength. Head and shoulders facing direction of travel (pick a distant marker to aim for and head towards it, or upwind of it). Look where you want to go. Rear leg slightly bent. Use this to steer into the wind. Failing to do any of these things will result in the "Walk of Shame" - the nemesis of all kiters. This basically means that you haven't been able to stay upwind, have drifted downwind as a result and have to walk back to your starting position where your gear is located. When walking on a beach keep the kite over water rather than over the beach/shore - if the wind drops the kite will land safely rather than on people or in palm trees. Bring your rear foot out of the strap (if using foot straps) and place it closer to your front foot.